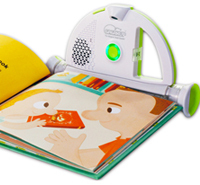 Tablettoddlers is intrigued by the Sparkup Magical Book Reader, a product developed in Israel that clips on to a book and then “reads” it aloud. The lightweight plastic device runs on batteries and can store up to 50 spoken-word editions of picture books, and offers a high-tech alternative to e-books for young children. Anyone can use the device to record a book. Starting in September, Sparkup will offer professionally narrated editions of children’s titles from Scholastic and other presses on its Web site. The company plans to roll out Sparkup to big box retailers starting September 1. Those outside the U.S. will be able to buy the product on the Sparkup Web site. The reading device currently retails for $49.95. This entry was posted in eBooks, Gadgets and tagged e-books, Scholastic, Sparkup Magical Book Reader by tablettoddlers. Bookmark the permalink.